Wild: Smaller but faster than Tyrannosaurus, larger but slower than Carnotaurus, Allosaurus Therotribus is the island’s resident pack-hunting theropod. While most aggressive theropods are relatively solitary creatures, Allosaurus lives in groups of 3-4. One Allosaurus is the Alpha, while the others are its mates or a beta male. Domesticated: Not everyone thinks a tamed Allosaurus is ideal. Those who value speed generally tame Carnotaurus, while those who value raw stopping power tame Tyrannosaurus. 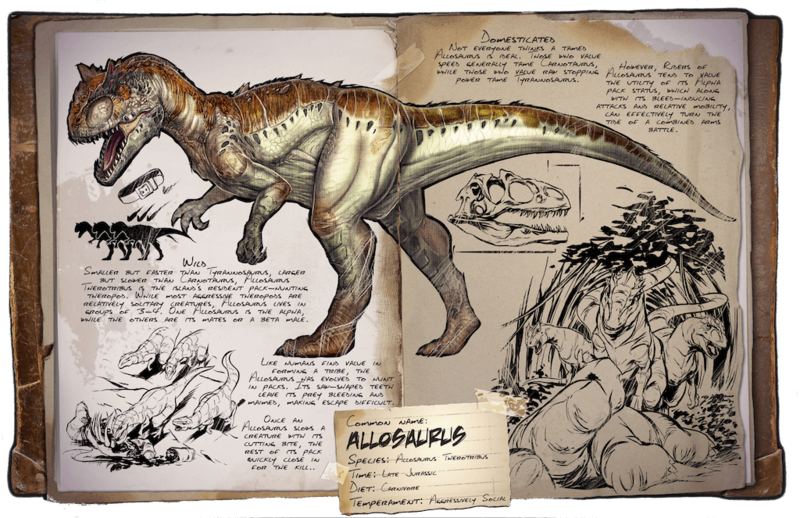 However, riders of Allosaurus tend to value the utility of its Alpha pack status, which along with its bleed-inducing attacks and relative mobility, can effectively turn the tide of a combined arms battle.